Grassy Narrows Chief Roger Fobister, with two young girls by his side, led a procession of hundreds toward the Ontario Legislature.“They cleaned an oil spill in the Gulf of Mexico. If there was a spill in Toronto’s harbour, that would get cleaned up,” said Roger Fobister Sr., chief of Grassy Narrows, a First Nations reserve north of Toronto. With slow and deliberate steps, Chief Fobister led a procession of hundreds down Toronto’s University Avenue on a Thursday in late July. Commuters were left at a standstill as marchers blocked four lanes to protest the failed government response to the mercury poisoning of northwestern Ontario Aboriginal communities more than 50 years ago. Two young girls by the chief’s side wore neon shirts that read, “Water is sacred.” Then came Grassy Narrows’ women leaders, many pushed in wheelchairs, too weak to walk the 1.5-kilometer route. Behind them followed a sea of First Nations people, many who had travelled for days to participate. As part of the Free Grassy movement, supporters held large swaths of indigo fabric and cut-out cardboard fish to represent the mercury-contaminated river system of the Asubpeeschoseewagong Anishnabek (Grassy Narrows) and Wabaseemoong (Whitedog) First Nations. Propelled by chants, drums, and outrage, the human river wound past streetcars and curious pedestrians on its way to the Ontario Legislature. 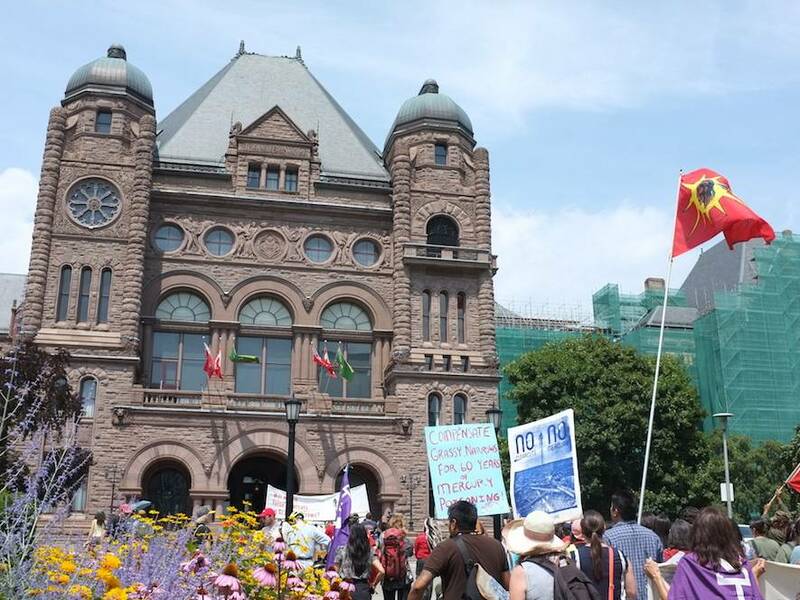 On the manicured grounds of Queen’s Park, demonstrators demanded that Ontario Premier Kathleen Wynne publicly apologize and take responsibility for the mercury poisoning. They also demanded adequate financial compensation, access to quality health care, an environmental health monitoring centre, clean-up of the contaminated river system, and a moratorium on clear-cut logging and other industry until a mutually agreed-upon plan is reached. These demands are not new. The English-Wabigoon River was severely contaminated by an estimated 10 metric tonnes of mercury intentionally released 50 years ago by a nearby pulp and chemical mill owned by the British multinational, Reed Paper Limited. This toxic release led to the closure of commercial fisheries in the early 1970s, and residents have since suffered from weakened motor control, slurred speech, tunnel vision, and miscarriages. 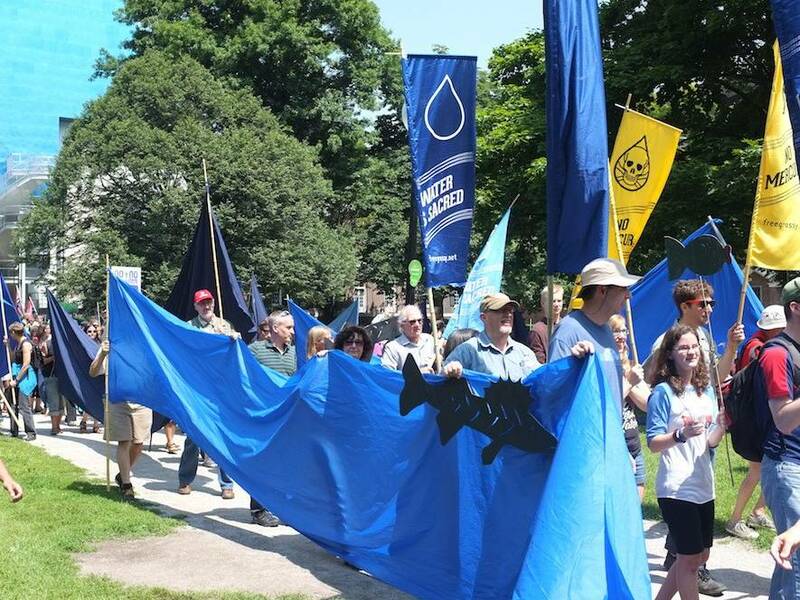 On July 31, hundreds marched through downtown Toronto demanding the government take responsibility for the contaminated English-Wabigoon river system. Unemployment skyrocketed, and morale sunk to new lows. The community was already trying to recover from the violence and upheaval of residential schools and the town’s relocation in the 1960s, after provincial hydroelectric dams flooded the people’s original homeland, wild rice crops, trapping routes and burial grounds. In the 1980s, an out-of-court settlement led to the creation of an independent board, the Mercury Disability Board, meant to support those affected by the mercury poisoning. But critics say the compensation has been inconsistently distributed, and the solution has been inefficient and a temporary one at best. Today, residents say the region’s water is still not safe to drink without boiling. Locals are urged not to fish or eat wild meat, despite a culture that has relied on such practices for centuries, and low-income families who rely on cost-saving measures to eat. I want to tell my children that I can hunt and fish without worry about getting sick. But Jack’s elders suffer or die prematurely, and a new generation of children battle developmental and physical disabilities. Jack says more devastation is on the way. A provincially backed logging plan to expand clear-cutting in the coming year threatens to increase levels of mercury, run-off toxins and pesticides used for tree plantations. Scientific studies have demonstrated that clear-cutting increases mercury levels in water and aquatic animals. Studies also show that Canadian Shield forest watersheds shed part of their mercury reservoir when timber harvesting disrupts soil and land. The latest accusation of neglect arose in July 2014 when it came to light that a Mercury Disability Board-commissioned report had not been publicly circulated. The 2010 report revealed shortcomings in terms of health care and compensation. It recommended a comprehensive epidemiological study to look at the outcomes of mercury exposure and how mercury interacts with conditions such as diabetes or high blood pressure. The report also noted the ineffectiveness of dietary warnings and health education regarding mercury pollution, recommending that future mitigation efforts be led by locals trusted within the community. Further, according to the report, other health determinants (such as cultural disruptions and declines in employment and income) have not been properly addressed. “I do think that an epidemiological study could be a good thing so that they [mercury survivors] could be assessed and could build a wellness plan,” said Margaret Wanlin, board chairperson of the Mercury Disability Board. Wanlin said that over $17 million in benefits have been paid out since 1985. Compensation ranges from $250 to $800 per person, based on the severity of symptoms consistent with mercury poisoning. Wanlin admitted that the payment structure has not been adjusted to account for inflation. However, Wanlin disagreed that the 2010 report was not distributed publicly. She said that all members of the disability board, including two chiefs and residents who attended meetings, had access to it. As to whether anything has changed since the report, Wanlin mentioned only assessments of symptoms, adding that any additional preventative or restorative health efforts were beyond the board’s mandate. The lack of response to the report’s suggestions, along with a new generation battling preventable illness, lead Grassy Narrows elder Steve Fobister Sr., 63, to hold a two-day hunger strike. “Two weeks ago I buried my brother, who died of complications of neurological disease,” said the former orator, fishing guide and Treaty 3 chief at the Ryerson University forum. He apologized for his slurred speech, explaining that debilitating nerve damage forces him to hold up his jaw when he speaks. 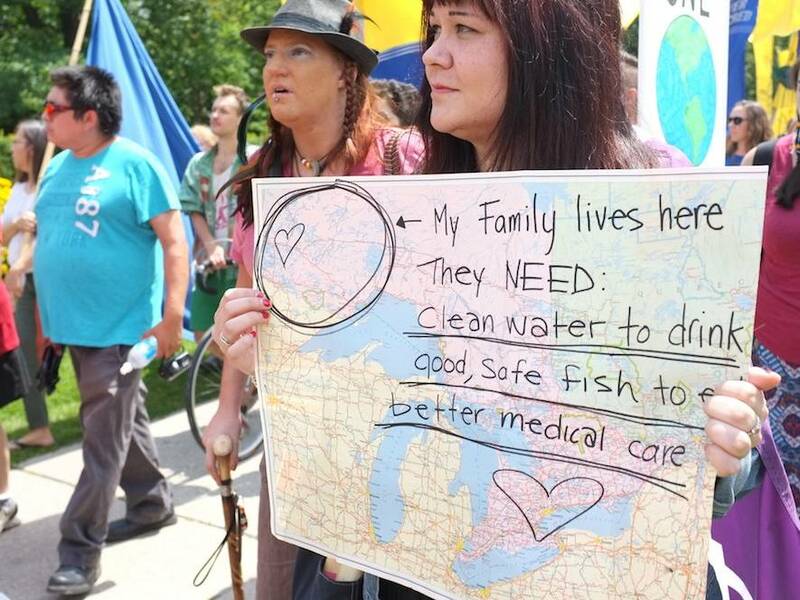 Grassy Narrows supporters drove hours to demand clean water and better health care in Ontario’s First Nations communities. Ontario Aboriginal Affairs Minister David Zimmer has expressed empathy and promised to push for a review of the board. He said he would explore options for more on-site treatment. The Wynne government has yet to mention any suggestion of a clean-up. In 1986, a clean-up was considered. The Ministry of the Environment issued a report on remedial measures, including dredging — an underwater excavation process that would gather and remove most of the mercury contamination resting on the river’s bottom. The process was estimated to cost $20 million over a six-year period. However, the report concluded that given the degree of uncertainty about the biophysical and economic benefits, dredging should not be implemented. Instead, according to the report, a compensation package should include funds devoted to rebuilding employment and lifestyle opportunities. At 80 per cent unemployment in 2014, Grassy Narrows is still waiting for those opportunities. Locals do not want to rule out a river clean-up, especially given technological advancements since the 1980s. River restoration in other areas shows that it can be done. Judy Da Silva, mother, daycare administrator in Grassy Narrows and recipient of the Michael Sattler Peace Prize, looks to Germany for hope. Stephen Lewis, former Canadian ambassador to the United Nations and Ontario NDP leader in the 1970s, also spoke at the forum. He observed that working with Premier Wynne to clean up the river rather than the federal government may be easier, given how tense the issue of Aboriginal rights is under Stephen Harper’s leadership. droite The refusal even for the federal government to turn over all the documents that the Truth and Reconciliation Commission required was a manifest example of bad faith. The people of Grassy Narrows say they appreciate all the support they receive these days, especially in regards to stopping clear-cutting. With plaintive and powerful voices, the old and young of Grassy Narrows, and their supporters, have urged Minister Wynne to respond to the crisis. The march ended with drumming and song at the Ontario Legislature.